No Doubt akosha.com is one of the best online business forums to solve consumer complaint. I am so excited to share such a useful website to you. Before I start a brief review here you may like check out some of awesome fact that make akosha.com tremendous to both consumer and business owner. 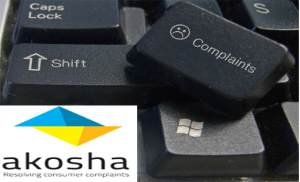 You can make any online complaints and lets akosha.com Handel this for you. You can get live chat support against your problem. Add a topic to akosha.com’s discussing forum and get expert advice. Consumer tadka , This one is my favourite you can get latest update on consumer related issue. Thousands of review from different product and service from all over the India. If you are business owner you add your company profile here and resolve all complaints against your bran and get 5 start reviews. I believe it’s defiantly helping you to sales increment and consumer satisfaction. Akosha is an online platform to resolve your online complaints. We all know now days submitting any complaints and get resolved not an easy task. Well, Akosha has everything that helps you to raised online complaints. If you have any complaints that not yet resolved by your service provider like – banks, shopping website, mobile or DTH recharge you can use Akosha.com to get resolved quickly. Akosha is now helpchat, personal assistant apps that help more things to done. You can download their apps from android phone and install akosha helpchat into your phone. Its work like a virtual assistant and you can asked any consumer complaints related query here. Everything will be free any you can make live chat to their consumer forum executive directly. Few days back I have a problem with ICICI Bank internet banking, surprisingly I found Rs- 3699 missing from my account without my notice. I submit complaints on bank and still after 3 days I don’t find any resolved. So what I try to do, Search for any way to get back my money that wrongly debited from my account. I found akosha.com, and contact them to resolved my problem. Akosha asked to send all related document scan copy with bank mini statement. After sending all those document its take 2 more days to credit my lost fund again into my ICICI bank account. akosha.com demand that they are now solving 70% of their complaints and almost 1958 plus query are answer each day. Also you can check the gross amount that akosha save by solving ton of complaints online. Can I use akosha.com to solved Online Jobs scam problem? Final word: I am a great fan of Akosha help chat I use 3-5 time in day and make my clarification into their helpchat, the customer executive are too friendly that sometime I thought I talk to a lower friend. Akosha You guys going to be rocks in India. Sir, onlinejobworks.com company fraud or not please reply me sir…. Dear team i rupesh Sharma faced cooling issue in my samsung double door refrigerator in last month as i launched a complaint and engineer visited my place and refilled the gas bt i faced the same issue with in next 3 days as I launched a complaint again then engineer visited my place and advise me that there is gas issue again as they will send some to refill the gas again, but no body’s turned up as now, even i made a call to customer care sarval of times but no action taken as of now and my complaint still open since last month as i request you to take necessary action.